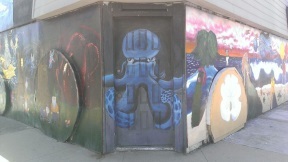 Ily Alfred, Group of Young Artists, to give Imperial Beach Landmark, Bibbey's Shell Shop, a Makeover this Saturday! The Imperial Beach Landmark, Bibbey's Shells & Rocks shop, located across the street from the Imperial Beach Pier will be getting a Makeover this Saturday Ily Alfred and other young artists from the community will get their turn and start on repainting the murals on the outside walls of the business at 8am on Saturday! regularly every few months he said but there were some issued that needed to be worked out and he is hoping he can get back to having it done regularly like before to give the young artists a chance to grow and show off their talents. Said Michael Bibbey, the shop owner,Graduated from Mar vista High School after moving to Imperial Beach in 1970. I likes to give young artists in the community a chance to display their talents and have the murals on the outside of his shop repainted, Michael said. The shop has gone over lots of makeovers on the outside of the shop. His family started the business in Imperial Beach at the corner of Seacoast Drive and Elm Avenue across from the pier in 1984 importing shells from the Philippines. 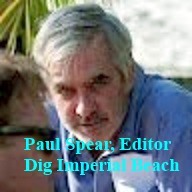 His dad, who was in the US Navy, Saw time in Guam, were he started collecting shells, Florida and the Philippians before being transferred to Imperial Beach. Michael's dad grew up on a farm in Missouri and he joined the navy after graduating high school. He served during the Korean War and got shot down and the plane crashed in the ocean. Michael said his father told him that he dragged the pilot out of the plane before it went sank and then they were floating around not knowing if who would find them first before the US Navy rescued them. Michael's father, Loyal Joe Bibbey is famous in the Shell Business and has several sea shells named after him. A "Photo Gallery" of the currant outside of Bibbey Shells Shop will be lost to history when the new makeover takes place this Saturday. The photographs are provided by Imperial Beach resident, Bryan Brillhart, of Bryan Brillhart Photography.